So, 50 years later, and plastics are ubiquitous in our everyday life. But not without an environmental impact, “microplastics”. Almost too small to notice, the term generally refers to pieces of plastic that are smaller than 5 mm in size, or about 2/10 of an inch. Microplastics can be found throughout the world’s ocean and coastal habitats—from surface waters to deep sea sediments, as well as in the stomachs of a variety of marine life—from plankton to whales. 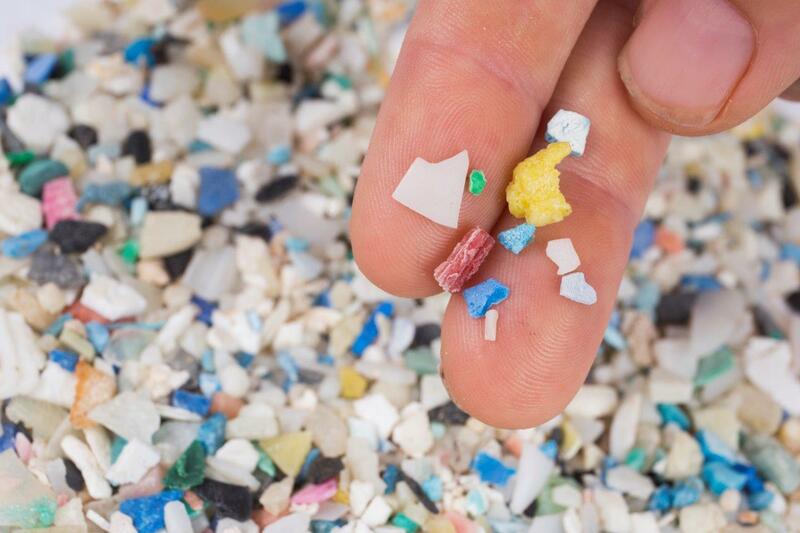 Primary microplastics are deliberately made as small beads, pellets or plastic fragments. For instance, polyethylene “microbeads” are ingredients in some toothpastes, many facial scrubs and body washes, as well as makeup products, deodorants and other personal care products. Others are pellets (often called “nurdles”) which are the form in which raw plastic is transported to plastic manufacturers. Some microplastics are created for use in sandblasting or polishing processes. Secondary microplastics are those that form as a result of the degradation of larger pieces of plastic. Petroleum-based plastics may never biodegrade, but physical and chemical processes (e.g. exposure to ultraviolet light, heat, or mechanical abrasion) can cause them to fracture into smaller and smaller pieces over time. Dr. Anthony Andrady, a plastics expert, said in the early 2000’s, “Except for a small amount that has been incinerated, every bit of plastic manufactured in the world for the last fifty years or so still remains. It’s somewhere in the environment.” Another source of secondary microplastics is the laundering of synthetic fabrics; thousands of tiny fibers can be shed in this process. How do microplastics get into water? We suspect two primary pathways by which microplastics enter the ocean—through wastewater treatment plant effluent and dumping/improper disposal of plastic waste and stormwater runoff. Wastewater treatment plants are quite efficient at removing fibers from doing laundry and “microbeads” from personal care products, but such large numbers of these enter the plants that even if 99% are removed, that still results in significant numbers of plastics making their way into the environment in the effluent. Additionally, sewage sludge is often dried and pelletized to make fertilizer. These pellets contain large numbers of microplastics, and the fate of these once applied to the land is unknown. Large plastic items are most likely to photodegrade on land, when exposed to sunlight. Plastics on land are easily washed into coastal water bodies during rain events. Many urban stormwater drains feed directly into bays or rivers, particularly in Florida. Microscopic plastic fibers are common in air; rainfall will transport those fibers to the land or water. What is the issue with microplastics in the ocean? In the ocean, there are many toxic chemicals which are attracted to the surface of plastics enough to bond chemically. One study found that some pollutants had concentrations a million times higher on the surface of plastic than in the surrounding water. Additionally, some of the chemicals used in the manufacture of plastics are known to be potentially harmful if eaten. Research has shown that when marine animals eat plastic, the toxins on and in the plastic can end up in the animals’ tissues. The impacts of this are not yet known. Scientists have estimated that up to 12.7 million metric tons of plastic entered the ocean (worldwide) in the year 2010. They further predict that this amount will continue to increase, making this is a global issue. 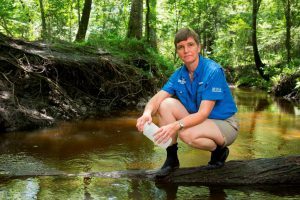 Maia McGuire will teach about microplastics at Science Cafe program. There are things we can do to reverse this trend. To learn more of the story and what you can do to help, please join us for our Science Café program on September 29, 2017 from 11:00 a.m. – 2:00 p.m. at the Lake County Extension auditorium, 1951 Woodlea Road, Tavares. Register online or call 352-343-4101 to reserve you spot. $5.00 pre-registration is required, and lunch is included.